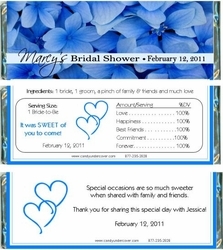 Blue Hydrangeas, so pretty with a bold blue color will look amazing at your Bridal Shower! Bring a bit of Springtime to any affair, any time of year with our stunning HYDRANGEA design wrapper. Perfect for Bridal Showers, Weddings and more. Chocolate is the SWEETEST favor and is sure to be a hit at your party!